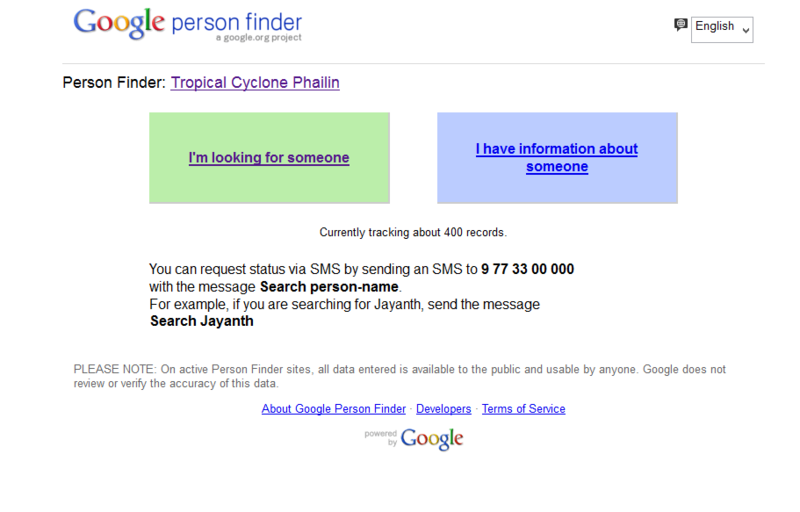 With the threat in eastern coast of Odisha and Andhra Pradesh region of being hit by Cyclone Phailin, Google has launched a ‘Person Finder’, an open-source software to help find thousands of people missing or displaced by the storm to reconnect with their relatives and friends. Google’s Person Finder helps individual to find information about their friends and family. People can post related information about their missing relatives and friends and search for the status of relatives or friends affected by a disaster, which is set up for the cyclone Phailin. Google has also set up a Crisis Response team to assist the governments in rescue of cyclone victims. This web based Person Finder tool is very easy to use. With only two buttons (as shown in above image) you can find a missing person and can add or share information on some person. You click on the green box if you need to search for someone, and any information relating to that person will show up on the results. If you need to share some information about someone, you can click on the blue box. All the information shared through this tool is available to the public.